Ever since celebrity and business tycoon Donal Trump showcased the solid bright pink tie on his TV series “The Apprentice”, businessmen all over the US coming from all industries are adding pink ties to their collection of neckwear. Before you add a pink tie to your ensemble however, there are a few basic dress rules you should follow. Below I am outlining three main conundrums for wearing the pink tie. Just like it is considered a fashion Faux Pas to wear white pants after labor day, pink ties should only be worn during the spring and summer season. Wearing a pink necktie with a tan colored suit on a cold and rainy day during Fall just doesn’t look right. 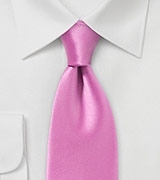 Thus, reserve your pink ties for the months from March through August, and avoid the summer look the pink tie during rainy, cold, and overcast days. Since pink is a color for spring and summer it must be matched with a complementing outfit. 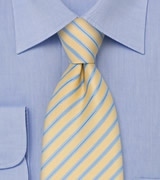 Excellent suit colors for pink ties are tan, beige, navy, light gray, and even charcoal. Just as important as the suit color is the fabric. Match the pink tie with a summer suit made from a lighter wool, cotton, seersucker, and even linen. 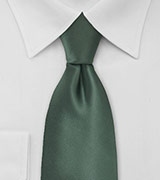 What you want to avoid are heavy fabrics and darker earth-tones such as olive and dark brown. 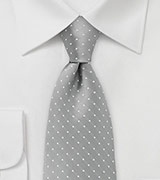 Just like the fabric should be lighter in weight, the pattern should be delicate and subtle. 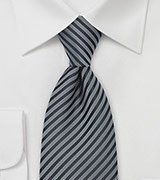 Perfect suit patterns are fine pin-stripes, very light checks, as well as solids. Just like the suit color, fabric, and pattern need to harmonize with the “summer look”, the accessories you choose need to be equally “summer like”. Should you decide to add a pocket square to your ensemble then a matching pink one would be perfect. (You may also want to read my guide on How to Fold a Pocket Square). Dress shoes should have a thinner and lighter sole that is preferable made from leather rather than a winter-like rubber. Excellent shoe, and also belt colors, are any shade of brown as well as classic black. 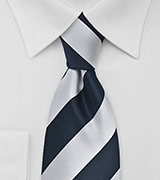 I am graduating from elementary school to secondary school and am wondering what sort of tie & knot would be appropriate for the ceremony. What about a tie bar or pin? How do you feel about tartan ties? I am 5’6″, pale skinned, blonde and rather thin. I have a burgandy dress shirt I generally wear with a black tie (and only on Sunday or for photos). I was invited to a Wedding as an usher. 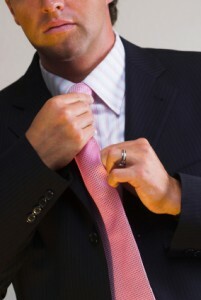 Dress code consists of a white long sleeve dress shirt,black trousers, and a pink tie. I was wondering how I can look my best at the wedding wearing these items. HI Zach, thanks for the question. The black pants and white shirt are quite basic pieces. 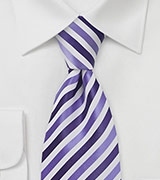 The pink tie will add a nice splash of color to your look. 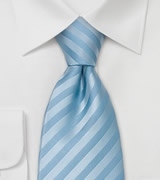 If you want to “spruce up” this look a little then here are some good options: #1 add a tie bar, #2 wear some fun colored socks that also have some pink color in them, #3 think about also wearing a vest (if you do, then you will not need a tie bar). I hope this helps! I thought almost always (except for sports activities where white is preferred) one should match the socks with pants.Is n’t adding fun colors with pink to your socks makes you a laughing stock? Just a thought let me know if I am wrong…. HI Dishan, thanks for your questions. In classic and conservative menswear the rule of thumb does exists that you want to match your socks to your pants. But, unless you are dressing for a black tie event, work in politics, or are dressing for a conservative business meeting, then colored socks are a fun way to add some personality to your outfit. In my opinion you don’t want to overdo it either. 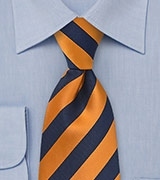 If you wear a blue suit, then navy socks with light blue stripes are a perfect match. Want something a bit “louder” then navy socks with pink polka dots or yellow chevron design would be great.